I enlisted my boyfriend to help me brainstorm for the "rainbow" prompt, and he immediately suggested Lady Rainicorn from the cartoon Adventure Time. GENIUS! As you may recall, I love the show. 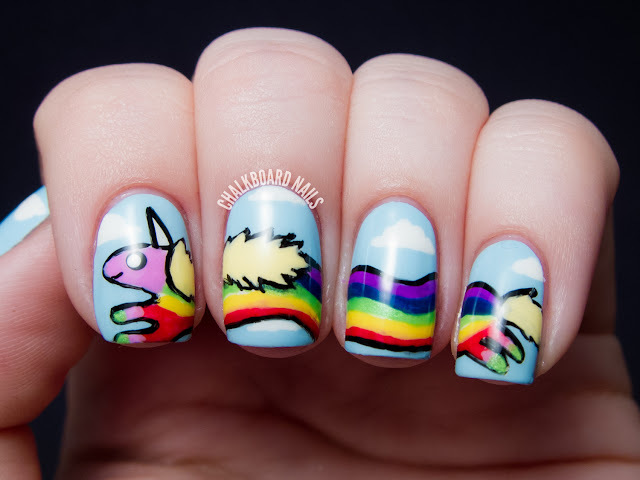 I've even done Adventure Time nail art once before! It seemed pretty obvious that for this design, I would have Lady stretched over my four nails. It's the only way to accurately represent her long rainbow body, and I love multi-nail designs anyway. The entire design was freehanded with my smallest nail art brush. The toughest part of the whole thing was the black outlining. Other than that, Lady was pretty easy to paint! Here's a long list of the shades I used and where I used them. I tried my best to match her colors as closely as I could! So, what do you think? Mathematical? 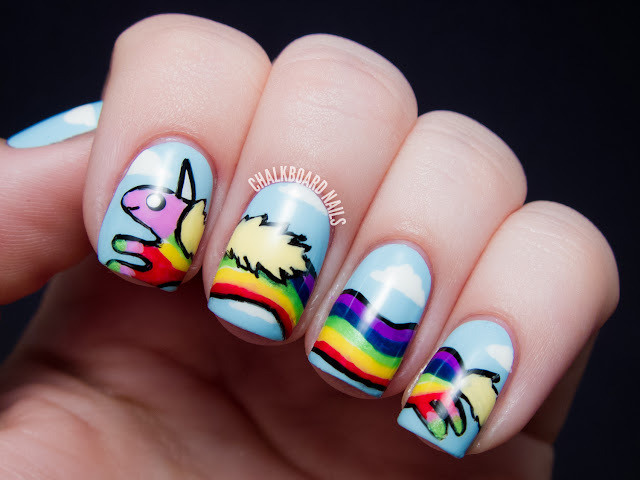 My rainbow nails from 2012! My rainbow nails from 2011! This is adorable! You have such steady hands it's cray cray! Geez. Wow. 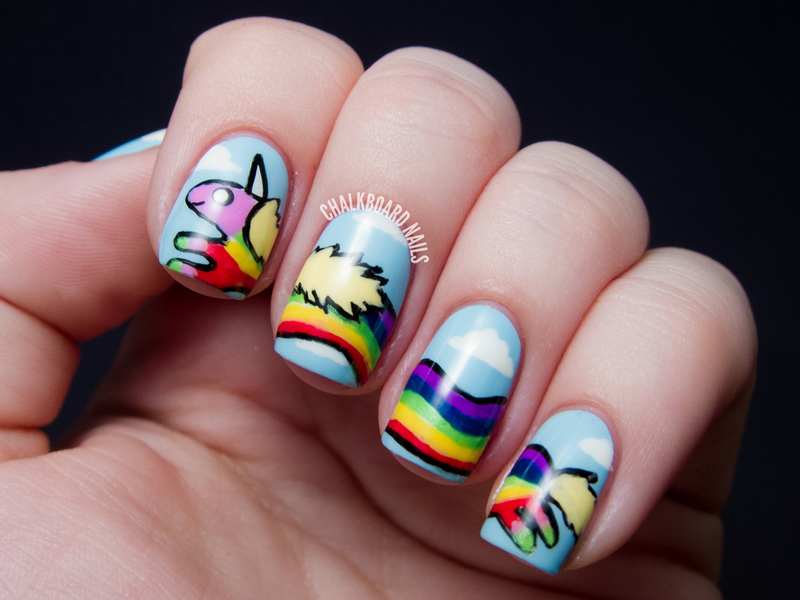 You're like Van Gogh of nail art. Except I hope you didn't cut off your ear. Geez. Wow. 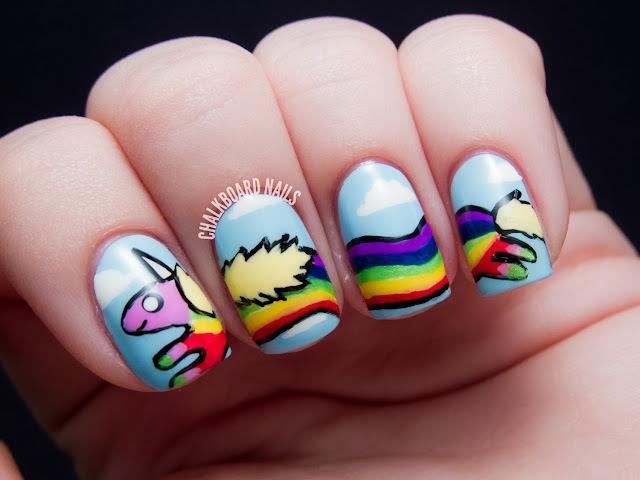 You're like Van Gogh of nail art. This is such a cute mani! I hope my freehand skills will bad half as good as yours someday! This is so brilliant! 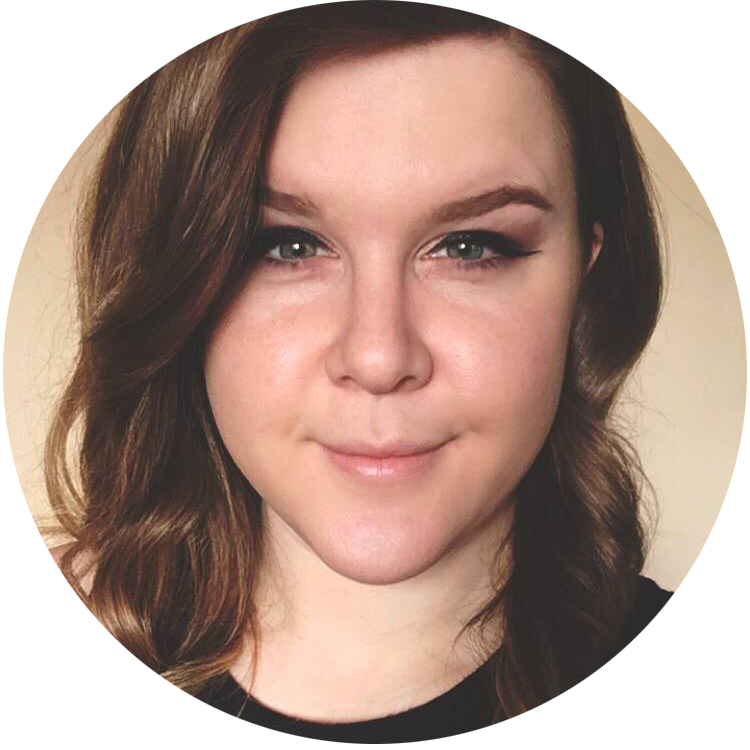 Your art skills are seriously amazing! Love them! You are amazing! So much detail! Loving it! this is why I love you. brilliant. 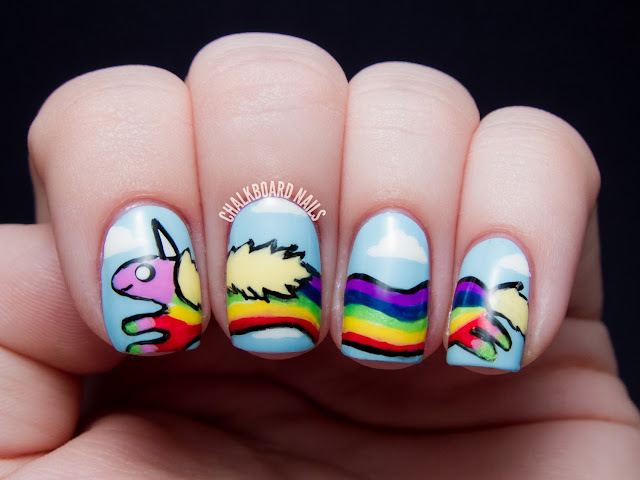 I love unicorn and rainbowns , soooooo cute!!! When I was planning out my designs, they're all fandom related, I was originally going to go the Rainicorn route. Ha! Adorable!! I have a friend who is an artist for Adventure Time. I just saw him this weekend at Salt Lake Comic Con, selling a ton of AT art. I have to show this to him! oh wow this is beautiful! AHH this is perfect, so so perfect! UGH genius! Yeah youre totally killin all the prompts! Fantastic and fun design, I love it!